Once you have set up for AAC, it is time to get started. The most crucial strategy we can use for AAC users is Modeling. Modeling is also sometimes called Aided Language Stimulation, Aided Language Input, or Natural Aided Language. Modeling is a strategy that should be used throughout the AAC journey. Once we learn to model, it will be something we will use often and regularly to support the AAC user to learn language and communication. Modeling simply means that we use the AAC system to talk to the AAC user. All AAC learners need to see what it looks like to communicate using their AAC systems in real conversations. We point to words or press words on the AAC system as we speak. By modeling words in everyday situations, we help an AAC user to learn what these words mean. It is a way to show an AAC user where words are in the AAC system and how they can be combined to create messages. When we first start modeling, it can be difficult and feel clumsy. But remember to just give it a go: any modeling is better than none! We start small and build up our skills at modeling each day. Every time we model, it will get easier. The most important thing is to start! This article will talk about the specifics of modeling and how we can do it to best support the language development of an AAC user. It will also cover some tips and tricks when modeling and how to overcome any challenges or concerns. AAC users need to see their AAC system in use. We don’t expect a typically developing child to learn to talk without seeing or hearing the adults around him talking. Nor should we expect someone who needs AAC to figure out how to use their AAC system, without seeing others using the system to communicate. When we model, the AAC users sees their AAC system being used to communicate real messages in real situations. An AAC user needs a great amount of input before we should or can expect them to use it reliably. When an AAC system is “not working” for a user, often the team should look closely at their modeling. Typically it can be a lack of modeling that is affecting progress and success of communication. An AAC user needs a great amount of input before we should or can expect them to use it reliably. All team members should model with an AAC user. Even peers, class mates and siblings can model AAC. Teams working together to model will bring more opportunities and success for the AAC user. Support and encourage everyone on the team to be comfortable and confident with modeling. Modeling can happen anytime, especially when AAC is always available. You can model all the time, not just during speech, snack, or morning circle. Any time you would talk to other learners, you can also model to a person using AAC. Modeling real messages in natural interactions and conversations is a valuable way for AAC users to see the power of meaningful communication. How often should we model? We must model as often as we can! Think about how long it will take the AAC user to learn how to use their AAC system if we only model for a few moments a day or week? What system can you model on? There are no right or wrong answers here. We should model on the AAC system that is available. We may model on the high-tech system or a light-tech variation of it. We may model on a class sized poster. If the AAC user allows, you can model on their system. Of course it is best to model on a system that closely resembles the system the AAC user uses - that way, the user is seeing the same symbols and navigation he or she will need to use. However, it may not always be possible to use an identical system. You may be modeling for a class full of students using different systems. Or you may not be able to afford two of the same high tech system. In these cases, use what you have available, and follow up when possible on the AAC user’s own system, to help him “map” what you’ve modeled on your system onto the location so he can find it on his own system. How many words do we model? Typically we match our modeling to the language level of the AAC user; meaning we model one or more words than the AAC user is currently using. If an AAC user is just starting out, they may not yet be using any words on the AAC system. Perhaps they have started pointing to one word at a time. For these AAC learners, you might model single words, with some 2-3 word sentences. For AAC users that are beginning to use 1-2 word combinations on their AAC system, modeling 3-6 word sentences would be appropriate. Then for AAC users are already producing 3-6 word combinations on their AAC system, we can model longer sentences, joining ideas and also model grammar and complex sentence structures. What words do we model? We can model both core and fringe words on our balanced AAC system. We can model specific or general words that will be powerful and effective for an AAC user, within an activity or experience. We can model different words to help them communicate for different reasons. We must give AAC users the chance to learn the words to do more than request. We should model comments and thoughts, rather than modeling and asking lots of questions. It is most important to select words that are both meaningful and motivating to the AAC user. Model words and word combinations that will occur often, so there are many opportunities for the AAC user to see them modeled. The AssistiveWare Core Word Classroom was developed to help teams find words that can be modeled across a variety of situations. Please join the classroom today for many useful ideas in the Core Word Planners on what words we can model. When we start out, we don’t need to model every single word we say, using the exact correct grammar. Instead we focus on modeling the key words in a sentence. We target the most important words needed to convey the meaning of the message. If I model this sentence : “ I GO SHOP GET BANANAS”, even though it is not grammatically complete, the general message of the sentence can be understood. Especially if it is modeled in context, as I am telling my friend about what I had done this morning. Key words is a powerful way to demonstrate how we start combining words to build sentences and language, without the demands of having to know/understand the grammar. Unfortunately when we first start modeling, we can become worried about not demonstrating correct grammar. But we all need to let that go! Logically, modeling key words before full grammatical sentences should make sense - this is probably how the AAC user will develop their language. They are likely to say and communicate to us in key words, before they start composing sentences, much the same as all people develop language! In time and with more modeling, they can develop the ability for more precise grammar, as long as they have an AAC system that allows for this grammatical development. When you are modeling on the AAC system, it is okay to use the AAC system to model 1-2 words (or however many are needed), while speaking the complete sentence aloud. For example, I could model on my AAC system “I go shop get bananas”, while saying “I went to the shops to get the bananas” with speech. 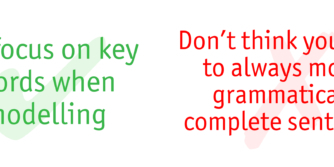 It is also okay to model the correct grammar at the right time for the AAC user. For example, if the AAC users says “I go shops” on their AAC system to talk about the weekend, then this may be a perfect opportunity to model. We can show how to use grammar supports to find the word “went”, or to model little words like “to” and “the” on the AAC system. Remember, you’re modeling the next step the AAC user needs to learn. At times, modeling may not go smoothly for a number of reasons. Let’s look at some common challenges when modeling and possible solutions. As discussed, sometimes we can get stuck if we try to model every word that we say. This makes modeling overwhelming. It is much easier to match the words you model to the current expressive language level of the AAC user. Often we make mistakes when we model. We point to the wrong word. It is fine to show an AAC user that we all get it wrong sometimes when we are talking! Sometimes the AAC user may not be looking at you or the AAC system directly when you are modeling. This doesn’t matter. All learners take in information in different ways. Some learners cannot look and listen at the same time and we may need to reduce our demands on them for this. Others use peripheral vision to watch modeling. Still others may only be able to watch us part of the time. Incidental learning can happen over time even without focused attention. We should keep modeling even if the AAC user isn’t looking - this keeps us in the habit of modeling, and gives us more practice finding words. 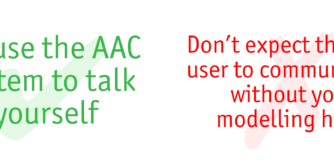 Often an AAC user may not respond to the model that has been provided. One of the hardest things we need to learn to do as we model, is to model without expecting anything in return. We may model a word for an AAC user. Then we can pause to give them time to take up their turn. If they do not respond, we can model the next words and continue the activity. Some AAC users need to see and hear words many times before we can expect them to use them to communicate with us. Often we get stuck modeling the language of requests, eg. “I want__”. There is so much more to language and full communication than simply asking for things. It is important that we model language to communicate different messages for different reasons. An AAC user does not have to copy or repeat the words you have modeled. They can listen and see your words, but they don’t need to repeat them. Look for engaging and fun ways to give them a chance have their turn to say something in motivating activities, rather than requiring them to copy you. As an AAC user starts using the AAC system more independently, often we see modeling around them stop or decrease. Please don’t stop modeling! Instead start modeling longer sentences. Start modeling grammar. Start modeling language for different communication functions. Just don’t stop! One model is not enough. We may need to model a word or word combination many times before the AAC user should be expect to use it. Model and then model again! Documenting how modeling works best for each individual AAC user will help all team members model most effectively. We know that modeling takes time and practice, but the benefits are great. Modeling is part of the AAC journey that will be ongoing. Modeling will always be a key strategy to help an AAC user learn language and real communication. A full list of references on modeling/aided language stimulation can be found in the AssistiveWare Core Word Classroom.